JabberCast is a podcast run by the staff of Jabberjays.net. You can find the list of episodes below. We are also currently under review for iTunes! The JabberCast music was composed exclusively for Jabberjays.net by Charles Samuel. In our premiere episode, Crystal, Tash, Jared, and Hannah talk about Catching Fire’s deleted scenes, speculate about why Buttercup 1.0 got fired, and discuss predictions for Mockingjay Chapter 1! Listen to the episode here. In Episode 2, Crystal, Carla, Tash, and Jackson talk to actor Nelson Ascencio, who plays Flavius in The Hunger Games movies, about filming Catching Fire, his twin brother, and what he’s up to next! Listen to the episode here. Episode #3 – What the Finnick?! For Episode 3, Carla, Crystal, Tash, and Ciara talk to playwright Dean O’Carroll about his play The Humor Games, including characters such as Tweeta, who only talks in 140 characters and hashtags. Then the jabberjays babble on about Mockingjay theories and find out what the pervy version of therapy gardening existing in Tash’s brain involves! Listen to the episode here. In Episode 4, we discuss all the new The Hunger Games: Mockingjay Part 1 content, set photos from Paris, the Cannes party, and then predict what comes next in the way of marketing. Listen to the episode here. Episode #5 – Uprisings, Real or Not Real? In Episode 5, the Jabberjays talk to Joshua Chislett about his upcoming Finnick Odair fan film and then discuss Thai uprisings and fandom trailer uprisings. TweetTalk is introduced! Listen to the episode here. With Episode 6, the Jabberjays are joined by fellow fansites Panem Propaganda, Victor’s Village, and Welcome to District 12 to talk all about the District Heroes, or District Zeroes when talking in propaganda terms, and the last day of filming for The Hunger Games. Listen to the episode here. In an emergency JabberCast session, the Jabberjays discuss the first Panem address from President Snow and Peeta Mellark, Together as One. Listen to the episode here. Beetee stops all our hearts with his rebel transmission. In Episode 8, the Jabberjays talk with fellow fansite admins from Victor’s Village and Down with the Capitol and pick apart the ‘Unity’ teaser. Listen to the episode here. The teaser trailer is finally out and so us Jabberjays had to record an episode to talk all about Comic Con and break down everything in Our Leader the Mockingjay! Listen to the episode here. Three weeks have flown by since we did an episode of JabberCast and so we’re back with a vengeance with Episode #10 (woohoo!) titled The Stalkingjay. Listen to the episode here. We’re back with Episode #11 of JabberCast to talk all about Lorde’s Yellow Flicker Beat and who we think Lorde has asked to be on the soundtrack for The Hunger Games: Mockingjay Part 1. Listen to the episode here. 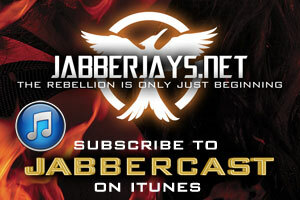 We’ve got a new episode of JabberCast for you to listen to over the weekend and this is a very special episode because we spoke with Megan Hayes, who played the female morphling in The Hunger Games: Catching Fire. Listen to the episode here. In this episode, we discuss both new TV spots for ‘The Hunger Games: Mockingjay Part 1’ that ripped out hearts out and baked it into some cheese buns. Listen to the episode here. For Episode #14, we frantically try to discuss the variety of clips raining down upon the fandom like there’s no tomorrow. Listen to the episode here. In Episode #15, we’ve all finally, officially seen The Hunger Games: Mockingjay Part 1, and we’ve got all the feels to pour out of our souls. Listen to the episode here. In Episode #16, we kick off 2015 by getting the scoops from Jennifer about the LA premiere of Mockingjay Part 1 and discuss the controversial Hanging Tree remix. Listen to the episode here. In this episode we discuss the ‘Remember’ teaser, the three-year anniversary of The Hunger Games, and speculate about what’s to come. Listen to the episode here. We’re fed up, so it’s time for a rant fest to get things off our chests about everything from no stills to missed opportunities to way off-the-mark tweets. Listen to the episode here. The first teaser for The Hunger Games: Mockingjay Part 2 landed this morning, so you know we had to do a JabberCast to let out all our feels and pick every last scene to pieces! Listen to the episode here. In Episode 20, we discuss all the stuff released during Comic Con including the awesome poster dump, the Comic Con panel, the District 13 Propo, and the trailer to come. Listen to the episode here. In Episode 21, we totally pick apart the full trailer for The Hunger Games: Mockingjay Part 2. Listen to the episode here. In Episode 22, we’ve brought our rant fest back to get more things off our chests about the lack of stills, the lack of soundtrack, the lack of news. Listen to the episode here. In Episode 23, we get together with our friends Kait from Victor’s Village and Theresa from Down with the Capitol to discuss the For Prim trailer, new stills, the world tour, and the new posters. Listen to the episode here. In Episode 24, we talk to Jabberjay Zack about the final trailer, discuss the “Chocovore Revolution,” and a deluge of new stills. Listen to the episode here. In Episode 25, we have our first Quarter Quell and break down the final trailer for The Hunger Games: Mockingjay Part 2. Listen to the episode here. In Episode 26, we hold an emergency JabberCast to discuss the first two TV spots. 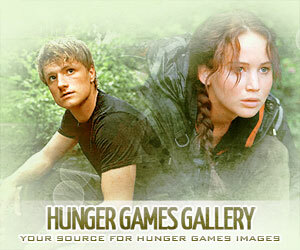 This episode marked thirty days to the release of The Hunger Games: Mockingjay Part 2. Listen to the episode here. In Episode 27, we have a last chat before Ciara saw The Hunger Games: Mockingjay Part 2 at a media screening in London. She weighs in on her final predictions and we make a few last terrible jokes. Listen to the episode here. In Episode 28, we had a whopping seven Jabberjays on to discuss our predictions for The Hunger Games: Mockingjay Part 2. This was the last podcast before release! Also, Ciara and Sarah talk a bit about the movie. Listen to the episode here.